GW Motorsport launch Jacky Liu’s Ford EcoBoost-powered racer in Market Harborough. Liu to begin pre-season testing programme at next week’s official test. Team boss Gary Ward keen for another driver to join his crack squad and compete in 2017 F4 British Championship. 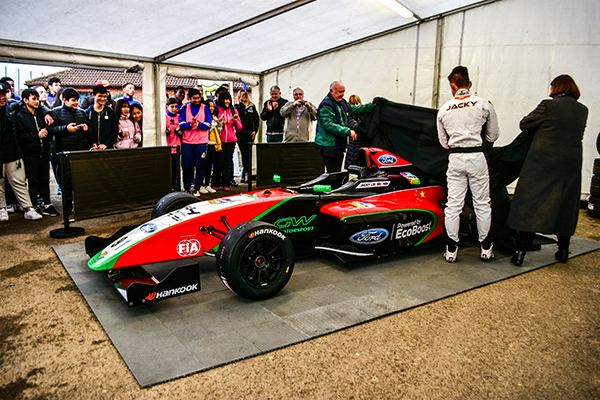 10 FEBRUARY, 2017 – F4 British Championship certified by FIA – powered by Ford squad GW Motorsport have unveiled the British F4 racer that Jacky Liu will use to contest the UK’s most competitive junior single-seater series in 2017. The 17-year-old from Shenzhen, China pulled the covers off the stunning car, emblazoned with the colours of the flag of his homeland, at Harborough Town Football Club. There were no shortage of people clamouring to get a glimpse of the machine, including local media and students from Brooke House College; the school that Liu attends in the picturesque town of Market Harborough. “This is a dream come true,” said a thrilled Liu. “I have come to British F4 from China because the standard is so much higher here. “I hadn’t seen the car before it was unveiled so I was just as excited to see it as everyone else. I couldn’t sleep because I was so excited. I love this car. The design is awesome. Said GW Motorsport boss and team owner Gary Ward: “It’s brilliant to launch our car with this fantastic livery. We’re well underway now and we will be at Brands Hatch next week for official pre-season testing. GW Motorsport are a new addition to the British F4 grid, yet both the team and in particular Ward who has had a long and illustrious racing career are no strangers to on-track success with a wealth of experience with karting, F3, Formula 3000 and F1 machinery. 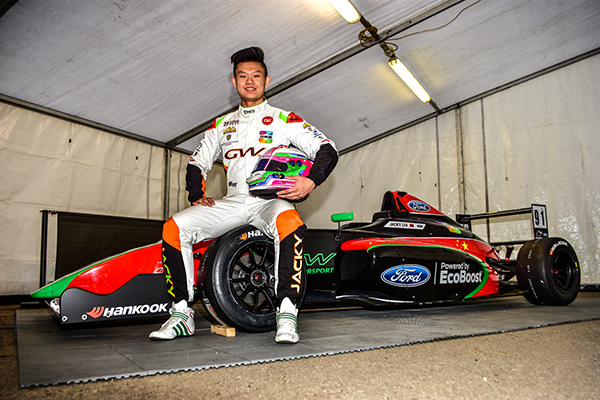 Liu’s rapid rate of progression thanks to GW Motorsport’s tutelage is something which has really pleased Ward. He is keen to take another driver under his wing for the 2017 season with a second Ford EcoBoost-powered racer ready and waiting at the team’s Northamptonshire base. “This time last year Jacky was karting and he’s come so far since then under our guidance. We’ve worked very hard and we’ve made so much progress. “We’ve also got a few other drivers on our books who are working their way up the ranks in karting and one will hopefully make the step up to British F4 next year. Ward also heaped praise on British F4: “I really rate this championship. I love the Ford EcoBoost-powered engines and the cars themselves. They look awesome. I’ve worked with all sorts of race cars in my career, but the British F4 car is lovely to work on. Brooke House College specialises in preparing students from all over the globe, taking an innovative approach to education. It supports students like Liu with their co-curricular activities while providing them with all the tools to succeed academically, giving them a bespoke learning experience which meets all their needs. Said Brooke House College director of marketing Carolyn Blackshaw: “It’s a really proud moment for Jacky Liu and Brooke House College. Jacky has been with us for two years now. We didn’t realise just how talented he was when we first met him. “He has proved he’s up to the challenge and the GW Motorsport team have really made it happen for Jacky. Gary started working with him pretty early on and quickly understood where his talents and strengths lie. Added Brooke House College principal Mike Oliver: “I’m tremendously proud. 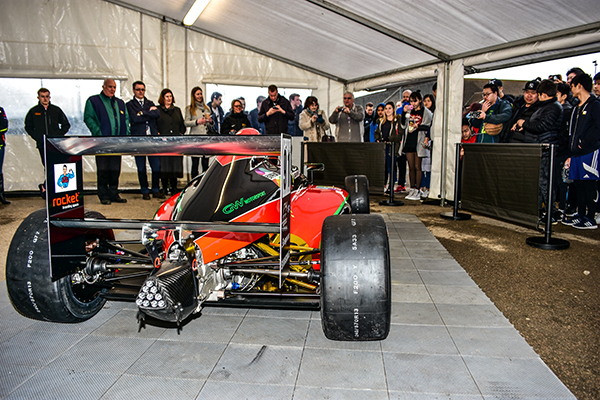 I don’t think there is a school in the land unveiling a racing car like this. It’s all part of our sporting excellence programme and our motorsport academy is an aspect of this. 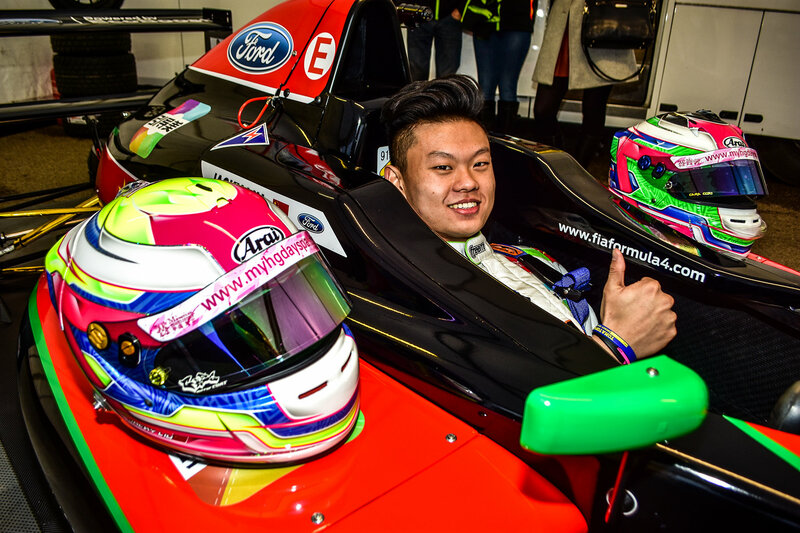 Liu and GW Motorsport will begin their pre-season testing programme in the second official test of the year on Thursday 16 February at Brands Hatch. Liu will take to the track alongside a host of the fastest young drivers from all over the world who will use British F4 as a platform to climb the FIA single-seater pyramid to Formula 1. The F4 British Championship certified by FIA – powered by Ford is still accepting registrations for the 2017 season and those looking for more information are encouraged to contact championship coordinator Eve Lake-Grange. Pictured: Feature shot - A big thumbs up from Jacky Liu who will become the first Chinese driver to race in the F4 British Championship certified by FIA - powered by Ford. 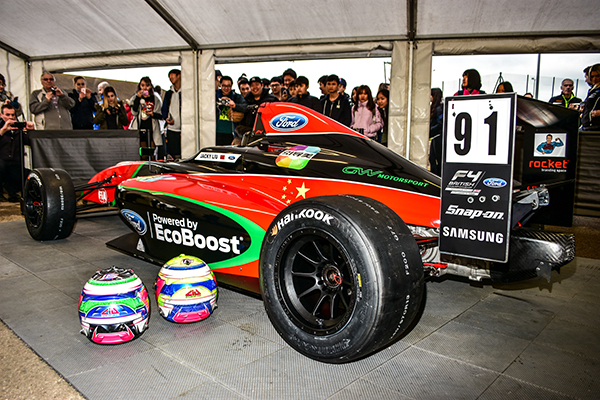 Above clockwise from top left: 17-year-old Liu will take on some of the world's fastest young drivers from all over the world in British F4; Students from Brooke House College, Market Harborough clamoured to get a glimpse of the Ford EcoBoost-powered racer; Brooke House College principal Mike Oliver and director of marketing Carolyn Blackshaw helped Liu take the covers off his British F4 racer; Liu will race for Gary Ward's GW Motorsport team in 2017. Images by Stu Stretton Media.